Kindness knows no boundaries. It has a ripple effect. One act of kindness can become the basis of countless acts of compassion. This is exactly what happened when a school in Saudi Arabia got inspired by the humanitarian acts of a brother and sister duo residing in Dubai. I live in Saudi Arabia in a city called Khamis Mushayt and work as a secondary school educator at Al Janoub International School. 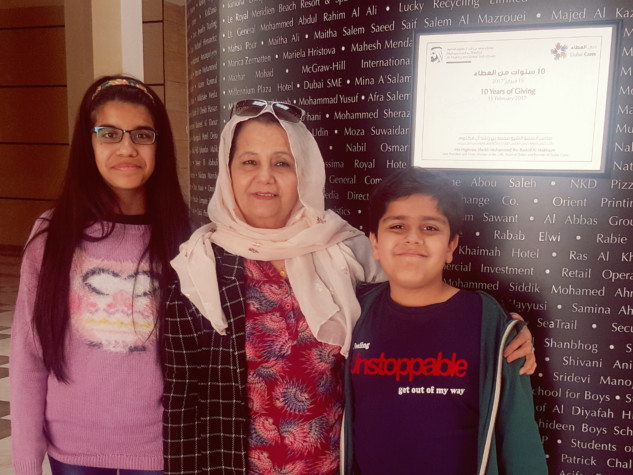 My grandchildren: 12-year-old Mishal Faraz and eight-year-old Mir Faraz were born in the UAE and have been raised here ever since. Through the years, I’ve seen them grow into compassionate human beings who are always looking for ways to be useful to the community and the planet at large. I always share pictures and videos of my grandchildren participating in the various community initiatives with the staff members and teachers in my school. This became a source of inspiration for the children and teachers in the school and all of us collectively decided that we wanted to, in our own way, contribute to the charitable causes that these two children were working so passionately for. It was through their work of many years that we got to know about Dubai Cares and the amazing work the organization is doing to provide education in underprivileged nations. Established by His Highness Shaikh Mohammad Bin Rashid Al Maktoum, Vice-President and Prime Minister of the UAE and Ruler of Dubai, this organisation passionately supports United Nations Sustainable Development Goal 4 - Quality Education for all and has benefitted 18 million students to date. As a school, we wanted to support this noble initiative and at the same time turn the whole experience into a learning opportunity for the students of the school. Hence, the initiative was launched. We called it “We Stand United for Dubai Cares”. The prime aim was to first educate the students about the hardships faced by the children living in regions ravaged by wars, diseases, poverty and natural disasters. Assemblies were held for this purpose and students were also encouraged to research about the Less Economically Developed Countries (LEDCs) and the various hurdles and hardships the people affected face every single day. Students also came to realise that the only key that could unlock a better future for these families is education. The idea was to make them understand that those children marred by the various disasters have the right to education just as any other child living in any part of the world. It is indeed understanding which leads to empathy and acceptance and ignites the will to extend a helping hand. The school also rolled out a competition in which students had to creatively define the importance of education in the form of posters, presentations, and poems. Finally, the funds from those who personally wished to contribute were collected and recently when I flew to Dubai to visit my family, I donated the collected amount to Dubai Cares. It gave a lot of satisfaction to me and my entire school community that our contribution will make a difference in the life of a child or children in some part of the world. And the experience has filled the students with the desire to extend a helping hand wherever and whenever they can. Mishal and Mir inspired the students in Saudi Arabia without ever meeting them or even having a single conversation with them. It was just their tales of kindness that motivated others to do something at their own level. I would like to tell all Gulf News readers to be kind, you never know who you might inspire. Kindness should know no bounds. Let us all believe in one world, one nation.